Ink Pistons are mechanics found in Octo Canyon. They shoot a ray of ink into the direction they are facing, dealing enough damage to either break Agent 4's armor in one hit or immediately splat them if they are without armor. A version of this obstacle called Ink Sticks, which are always extended, appears in the Octo Expansion. 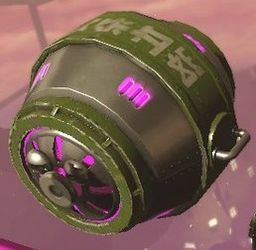 Ink Pistons are small Octarian machines found in Octo Canyon. They appear to have faces made up of three bolts: two making the eyes and a bigger one making the mouth. They can be seen bolted to any wall or in their own floating tank, placed horizontally or vertically. Although Ink Pistons behave similarly to a Gusher, the Piston activates itself and shoots out a ray of ink. On the first Octo Canyon mission they appear in, Sunset Octocopter, Marie tells Agent 4 that they should not touch them. A set of active Ink Pistons. Another Ink Stick in a tank.